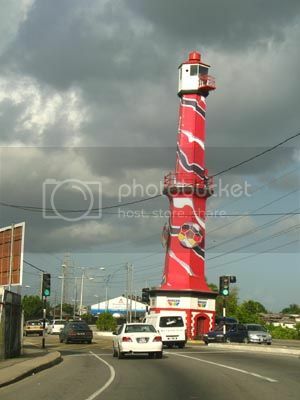 I know some people like the way they painted the old Port-of-Spain lighthouse over earlier this year as a tribute to the Soca Warriors ... but I had preferred it in the original plain white and was mortified the first time I encountered this new design and what I found to be garishly-put-together colours. But yesterday after the match, as I drove home, the lighthouse suddenly didn't look so unsightly. In fact it was a proud national monument, standing tall, strong and confident in spite of heavy, dark, English-looking clouds. But I have to disagree, while I might be proud of the footballers because they really did play well...I still think that what was allowed to happen to the light house is absolutely ridiculous. I thought it was painted too at first.